Throughout her long political career, it's safe to say that Hillary Clinton has faced pretty much every single sexist comment in the book. From assessments of her clothing to her demeanor to her health, people cannot stop talking about her and demanding that she act, dress, or be a certain way. Often, she's told she comes off as cold, and that she needs to project a warmer image. 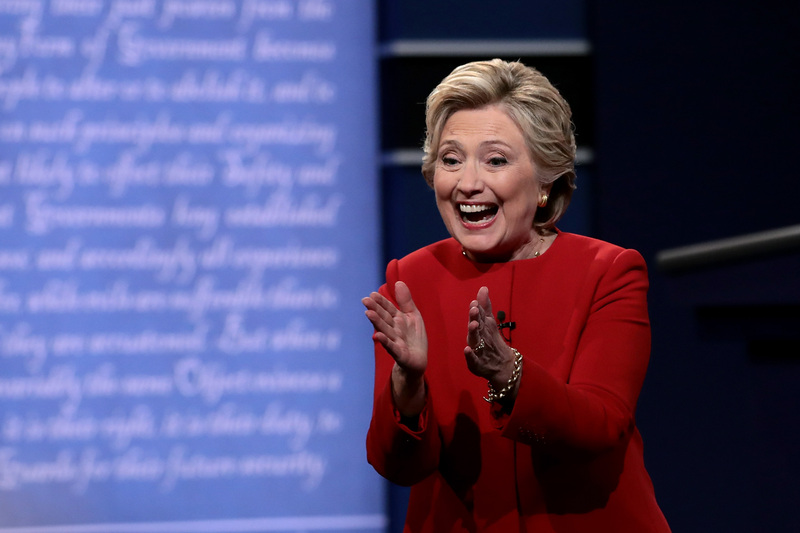 Well, during the first presidential debate on Monday, Clinton beamed as she took down Donald Trump, which led an editor on Twitter to comment on the fact that she was so cheerful the whole night. At this point, Clinton has to be used to men telling her she should smile. It happens so often that after many appearances, she gets that same feedback from commentators and anchors who for some reason feel that she should convince viewers that she's happier than they think she appears. It's completely unfair to judge Clinton for her facial expression, as if there is some standard quota of smiling that she needs to uphold in order for people to take her seriously. On top of that, why should she smile when she's talking about serious things like foreign policy or ISIS? Especially considering the fact that you don't hear people talk about Trump this way. There are so many examples of men telling Clinton to smile that it's alarming. So when an editor at The Atlantic asked why she was smiling so much, it was an opportunity for users to remind us all of the sexism Clinton faces during pretty much every public appearance she makes. It's time for commenters to leave thoughts about women smiling behind, because it shouldn't even be a topic of discussion. Since when was Trump criticized for looking serious while talking about serious topics? And how about President Obama? There are plenty other things that should be talked about — policy, plans for the future of the country, even criticizing the way she handles transparency is a valid way to talk about Clinton. But there's absolutely no need to perpetuate this sexist train of thought, especially after she's already made history.